This tutorial provides a brief introduction to the Racket programming language by using one of its picture-drawing libraries. Even if you don’t intend to use Racket for your artistic endeavours, the picture library supports interesting and enlightening examples. After all, a picture is worth five hundred “hello world”s. Along the same lines, we assume that you will run the examples using DrRacket. Using DrRacket is the fastest way to get a sense of what the language and system feels like, even if you eventually use Racket with Emacs, vi, or some other editor. Download Racket, install, and then start DrRacket. See the DrRacket documentation for a brief overview of the DrRacket IDE. Then click the Run button. You’ll see the text caret move to the bottom text area, which is the interactions area. If you’ve used DrRacket before, you might need to reset DrRacket to use the language declared in the source via the Language|Choose Language... menu item before clicking Run. Note that DrRacket highlights in pink the expression that triggered the error (but pink highlighting is not shown in this documentation). The hyphen in the name hc-append is just a part of the identifier; it’s not hc minus append. The function name starts with h because it combines pictures horizontally, and the next letter is c because the pictures are centered vertically. If you wonder what other functions exist—perhaps a way to stack pictures vertically and left-aligned?—move the text caret to the name hc-append and press the F1 key in DrRacket. A browser window will open, and it will give you a link to the documentation for hc-append. Click the link, and you’ll see lots of other functions. If you’re reading this in HTML form, you can also just click on hc-append or any other imported identifier that is used in this tutorial. As you can see, the hc-append function accepts an optional number argument before the picture arguments, and it accepts any number of picture arguments. When a number is provided, it specifies the amount of space to add between pictures. We could have evaluated the define forms for c and r in the interactions area instead of the definitions area. In practice, though, the definitions area is where your program lives—it’s the file that you save—while the interaction area is for transient explorations and debugging tasks. ; A semi-colon starts a line comment. ; The expression below is the function body. In the same way that definitions can be evaluated in the interactions area, expressions can be included in the definitions area. When a program is run, expression results from the definition area are shown in the interaction area. From now on, we’ll write our example definitions and expressions together, and you can put them in whichever area you prefer. The examples will build on each other, however, so it’s best to put at least the definitions in the definition area. 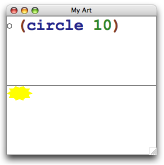 That is, the identifier circle is bound to a function (a.k.a. “procedure”), just like c is bound to a circle. Unlike a circle picture, there’s not a simple way of completely printing the function, so DrRacket just prints #<procedure:circle>. The parenthesized names after a lambda are the arguments to the function, and the expression after the argument names is the function body. Using the word “lambda” instead of “function” or “procedure” is part of Racket’s history and culture. Most Racketeers prefer to use the shorthand function form with define instead of expanding to lambda. Racket is a lexically scoped language, which means that whenever an identifier is used as an expression, something in the textual environment of the expression determines the identifier’s binding. This rule applies to identifiers in a lambda body as well as anywhere else. Here’s another example, where rgb-maker takes a function and returns a new one that remembers and uses the original function. 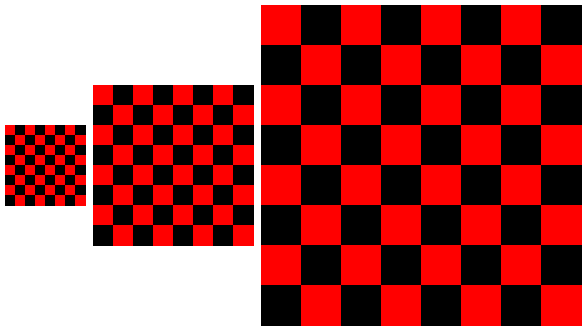 Note how composing functions via rgb-maker creates a different alignment of objects within the picture compared to using rgb-series. Racket inherits much of its style from the language Lisp, whose name originally stood for “LISt Processor,” and lists remain an important part of Racket. As you can see, a list prints as a single quote and then pair of parentheses wrapped around the printed form of the list elements. There’s room for confusion here, because parentheses are used for both expressions, such as (circle 10), and printed results, such as '("red" "green" "blue"). The quote is the key difference, as discussed elsewhere. To help emphasize the difference, in the documentation and in DrRacket, result parentheses are printed in blue, unlike expression parentheses. Note that (vc-append (rainbow (square 5))) would not work, because vc-append does not want a list as an argument; it wants a picture as an argument, and it is willing to accept any number of them. The apply function bridges the gap between a function that wants many arguments and a list of those arguments as a single value. all of the code that you put in the definitions window is inside a module. Furthermore, the module initially imports everything from the module designated by slideshow, which exports picture-making functions as well as more commonly used functions such as list and map. Some modules are packaged in the Racket distribution or otherwise installed into a hierarchy of collections. For example, the module name pict/flash means “the module implemented in the file "flash.rkt" that is located in the "pict" collection.” When a module name includes no slash, then it refers to a "main.rkt" file. Some collections of modules are distributed as packages. Packages can be installed using the Install Package... menu item in DrRacket’s File menu, or they can be installed using the raco pkg command-line tool. For example, installing the "avl" package makes the avl module available. Packages can be registered at https://pkgs.racket-lang.org/, or they can be installed directly from a Git repository, web site, file, or directory. See Package Management in Racket for more information about packages. To save your definitions, use DrRacket’s Save Definitions menu item. and when you run "use.rkt", a rainbow list of squares is the output. Note that "use.rkt" is written using the initial import racket, which does not supply any picture-making functions itself—but does provide require and the function-calling syntax. Racketeers typically write new programs and libraries as modules that import each other through relative paths and collection-based paths. When a program or library developed this way seems useful to others, it can be registered as a package, especially if the implementation is hosted in a Git repository. 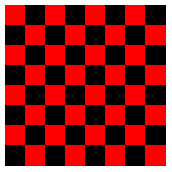 Instead of a circle, the result is a picture of the code that, if it were used as an expression, would produce a circle. In other words, code is not a function, but instead a new syntactic form for creating pictures; the bit between the opening parenthesis with code is not an expression, but instead manipulated by the code syntactic form. This helps explain what we meant in the previous section when we said that racket provides require and the function-calling syntax. Libraries are not restricted to exporting values, such as functions; they can also define new syntactic forms. In this sense, Racket isn’t exactly a language at all; it’s more of an idea for how to structure a language so that you can extend it or create entirely new languages. This kind of definition is a macro. The (pict+code expr) part is a pattern for uses of the macro; instances of the pattern in a program are replaced by instances of the corresponding template, which is (hc-append 10 expr (code expr)). In particular, (pict+code (circle 10)) matches the pattern with (circle 10) as expr, so it is replaced with (hc-append 10 (circle 10) (code (circle 10))). Of course, this sort of syntactic extension cuts both ways: inventing a new language can make it easier to say what you want, but harder for others to understand. As it happens, the developers of Racket are constantly giving talks and writing papers that involve Racket code, and it’s worthwhile for everyone who works on those products to know about code. In fact, you might want to take a look at the source of this document. You’ll see that it starts with #lang, but otherwise doesn’t look a lot like Racket; nevertheless, we build this document by running its source as a Racket program. We have to use a lot more than syntax-rules to extend Racket’s syntax enough for writing documents, but Racket’s syntactic extension can take you a long way. An object system is another example of a sophisticated language extension that is worth learning and using for Racket users. Objects are sometimes better than functions, even when you have lambda, and objects work especially well for graphical user interfaces. The API for Racket’s GUI and graphics system is expressed in terms of objects and classes. Each canvas stretches to fill an equal portion of the frame, because that’s how a frame manages its children by default. This introduction to Racket purposely avoids many of the traditional ways of introducing and distinguishing Lisp or Scheme: prefix arithmetic notation, symbols, quoting and quasiquoting lists, eval, first-class continuations, and the idea that all syntax is really just a lambda in disguise. While those are all part of Racket, they are not the main ingredients of day-to-day programming in Racket. Instead, Racket programmers typically program with functions, records, objects, exceptions, regular expressions, modules, and threads. That is, instead of a “minimalist” language—which is the way that Scheme is often described—Racket offers a rich language with an extensive set of libraries and tools. If you are new to programming or if you have the patience to work through a textbook, we recommend reading How to Design Programs. If you have already read it, or if you want to see where the book will take you, then see Continue: Web Applications in Racket. For experienced programmers, to continue touring Racket from a systems-oriented perspective instead of pictures, your next stop is More: Systems Programming with Racket. To instead start learning about the full Racket language and tools in depth, move on to The Racket Guide.